Flow Festival has become synonymous with bringing music from old school legends to topical newcomers. Beyond the music, Flow, offers a warm embrace of the arts and an exceptional array of world spanning cuisine. Only a short walk away from the centre of Helsinki, the festival strikes an alluring setting for a few days of blissed-out festival escapism. Flow was created in 2004 by Tuomas Kallio and his friends in jazz collective Nuspirit Helsinki, to offer something new to the music and urban events field in FInland. The popular event quickly grew, and by 2007 they changed the venue to the vast Suvilahti area. One of the reasons of the popularity is the attention the organisers put into the actual festival experience in addition to the line-up names. Flow is known for its food, drinks, decoration, design, atmosphere and art. From 2004 to 2010 the festival was organised as part of the multi-arts festival Helsingin juhlaviikot (Helsinki Festival), but as Flow grew bigger the organisers decided to organise the festival independently. The festival was founded by jazz group Nuspirit Helsinki and Tuomas Kallio, in cooperation with Helsinki Festival. Suvi Kallio, Juhana Heikonen and Pia Lääveri are some of the other main actors. Local radio channel Radio Helsinki, owner of the adjacent power plant Helsingin Energia and Nokia are some of the commercial partners of the festival. The City of Helsinki Cultural Office and the Ministry of Education and Culture are also supporters. Design is very important for the festival. It’s a crucial part of the brand of Flow, which is visually and aesthetically very refined. Marketing, communication and the festival venue are thought through, and made to be modern and distinguishable from other festivals. Especially the design and execution of the festival area is a field where Flow Festival has made a groundbreaking difference to other Finnish festivals, in paying much attention to both the general plan and details. The contrast between new and old, the protected power plant buildings and the temporary festival structures intertwined with each other, is an important part of the Flow experience. 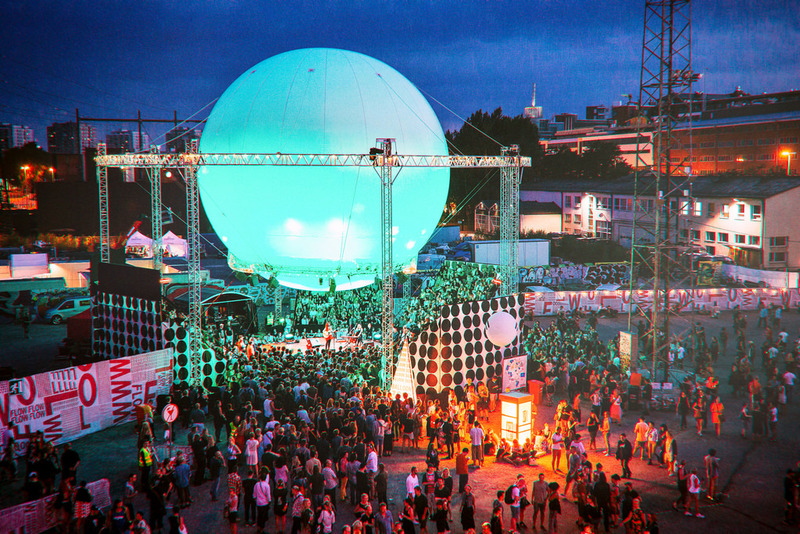 In 2012 Flow Festival collaborated with European Architect Students Assembly, creating the Balloon 360° stage, which has been used at every festival since.